Keatext is perfect for anybody who needs a precise understanding of voice of customer or employee, in hospitality, retail, or HR, it gives you marketing data for brand loyalty & reputation management. Pros: I got a chance to use Keatext for a client and I loved it. There are so many ways you can use this tool to get better at marketing. The sky is the limit - literally. 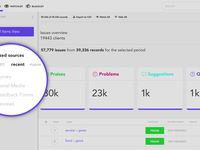 Since then, I have recommended this tool to several clients who were struggling to understand their customers and were interested in creating buyer personas. 3. 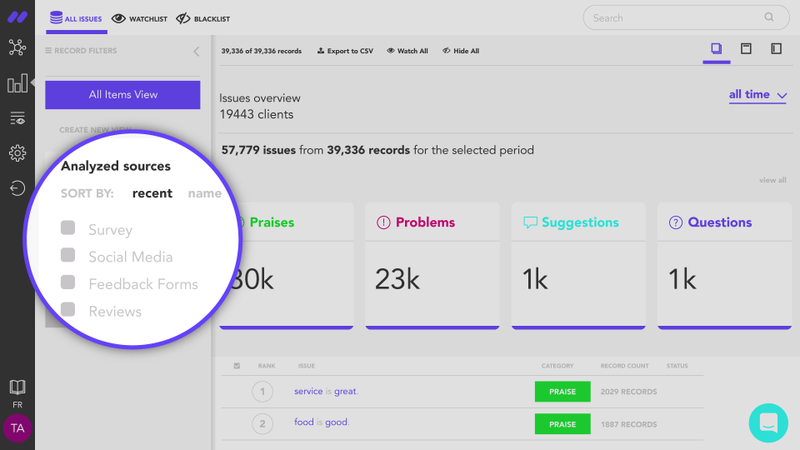 Let's you monitor customer sentiments, trends, and more across multiple channels. Cons: 1. They have blacklisted IPs of several countries which restricts potential clients from accessing their website. Not sure what's the logic here but if it's a global tool, everyone should be able to access website. Overall: Definitely recommended if you're interesting in analyzing text feedback and use it for decision-making. We do not blacklist IP addresses, though we have safety features in place to prevent suspicious activity. Feel free to reach out if you have troubles accessing our tool! 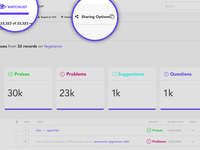 Pros: The sentiment score it provides as well as the text categories such as problem, praise, suggestion, question. Cons: Because there is a limit of data depending on you pricing, when you upload a file by error (not right file, data not prepared before hand, etc.) and have to delete and reupload, it counts in the data limit. However, I must say Keatext has always been very open to exceptions to increase limit in the past for these special situations. I'm grateful you took the time to review our platform. Not only are you our oldest customer, but you're a true partner in helping us grow and better ourselves. Pros: I love the user interface and how easy it is to move between pages. and we can just keep clicking on the words to go deeper. Glad you enjoyed the overall experience. I wonder what went wrong with the groups back when you were using it. We'll keep an eye on it, thanks for the heads up! Thank you for the review, it contained valuable feedback! Pros: Easy to use, good visuals, easy to import data... it was fun to see hypotheses get confirmed or infirmed by the analysis. It was the first time that i tried a software with a sentiment analysis this well presented. I was able to export intelligence from my analyses that were very valuable to me. Cons: Sentiment analysis needs very large amounts of data to be relevant. Even if i liled the output, i was not able to get lots of value with smaller data sets. The precision was sometimes off and i had to manually analyse the data afterwards. I'm happy you shared some insights into how you used the tool. I think you tried our previous version, since then we've improved our analytics including the sentiment analysis. Your observation concerning small datasets is very interesting. I'd be curious to know what's your threshold of small vs. large. I usually prefer datasets with at least 3000 comments, just to be closer to a statistically significant sample size. Please get in touch if you'd like to take it for another spin and thank you kindly for all the details you shared in your review. Pros: It's easy to import data and to analyze it, the learning curve is super fast as the software is well built and easy to learn. The team was also there for me if I had questions. I liked that I could be autonomous in a matter of hours. Cons: The analysis features were not exactly to my liking, and I felt the lexical analysis could use more statistical techniques for large datasets. Thank you for sharing your thoughts with us. It's great to hear you had an easy time using the software. I'd love to learn more about your last point concerning additional statistical techniques for the lexical analysis. I'm also curious to know which version of the application you used, we've advanced quite a lot on the types of analytics we do. Please get in touch if you have a few minutes to share more details. Pros: I thought it was interesting to have a quick and easy way to see positive comments and negative comments as a trend and by terms. Cons: The AI would often wrongly flag things as negative or positive because our users use interesting expressions and speak extremely casually. The software doesn't provide us enough value because it doesn't help our staff answer tickets more quickly. Overall: Knowing general sentiment of people writing into our support team. Thank you for taking the time to review Keatext, your feedback is much appreciated! Since you last spoke to Jay we've upgraded our analytics engine, which means we have improved accuracy even when users talk casually. We even added the feature you suggested!- an overall satisfaction score extracted directly from the comments. However, you're right, it wouldn't help much with the use case of answering individual tickets. 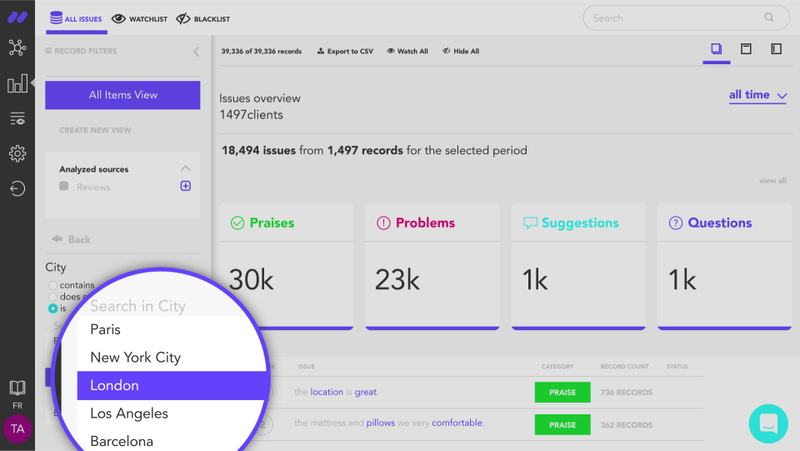 Most of our customers use Keatext to extract overall trends and themes to help inform strategic decision makers (product managers, community managers or customer experience managers). Thank you once again for your invaluable contribution! Pros: Grouping feature is quite convenient. Cons: Reaching customer care is a lil bit of a hassle. Thank you for bringing up so many interesting points. You're right, there's a lot of scope for us to grow and helpful feedback like the one you provided will help us get there. 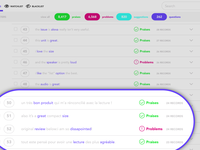 I'm confident you'll see a lot of improvements in the sentiment analysis once you try out our latest version of the product. I'm very sorry to hear you had difficulties reaching customer care, we're working on improving our processes to increase responsiveness. Next time we'll be there for you faster. 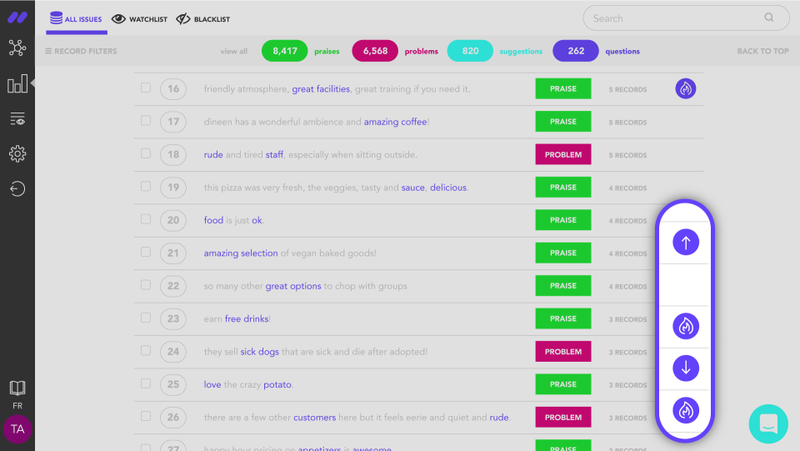 Pros: Help us to know the emotions of customers and the interface is really clean and userfriendly. Can put more that one database and compare them to each others. Cons: Would like to be able to separate the different data imported. For example, in different projects. Also, some icons are not that visible. We're very happy you took the time to share your thoughts and that the overall experience was positive. You're right about those icons, we've just hired a UX designer, so expect to see some massive improvements in the interface. For now the only way to separate data is either by having different accounts or through watchlists. We're looking into introducing projects, but it might take a little while longer. Pros: It is quick to set up, very easy to use and explain to others. Makes analyzing a large set of reviews quicker. Cons: Better for text analytics - sentiment analysis is not sophisticated enough. 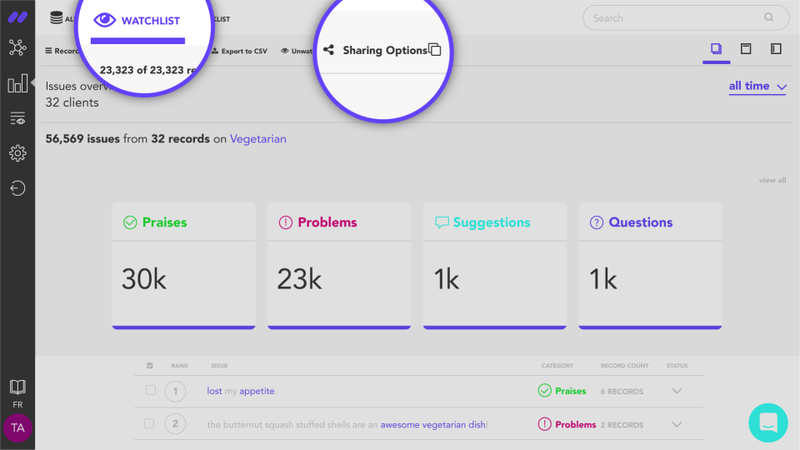 Cons: Doesn't seem to have too many features - does sentiment analysis of keywords, allows you to bucket and create themes. What would have been amazing if it somehow grouped words together and made themes on it's own. Overall: It's simple and effective, good to use for doing overall sentiment analysis of a something simple like a survey. Need to manually bucket entries and create themes is a pain though. 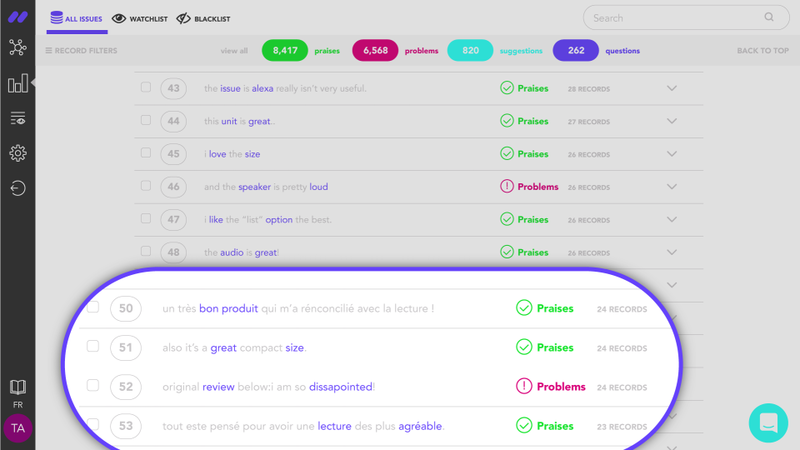 We evaluated Keatext during a test period and were very impressed with the results. Pros: The Keatext interface is clear and easy to use. Keyword groupings and the display of sentiment measurement graphs are useful. Cons: None. We have not completed the product testing yet. A complementary offer for other data formats would be appreciated. Thank you for reviewing Keatext! I am glad your experience was positive. My colleague in Customner Care will follow up on your request. 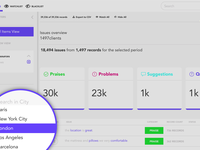 Pros: It is another tool to use as we review the survey comments and understand the concerns. Cons: It seems a little convoluted, klunky, lots of steps to get to something useful, but still not what we are looking for. Overall: It doesn't completely mitigate the need to read every comment and categorize them myself. The hope was the text analysis tool would mitigate the need to read every comment, but it doesn't quite get there. Cons: The verbatim is mainly based on keywords used in the sentence such as "Good", "bad" etc. And aren't always accurate. Pros: I like that it can assess connotations within long reviews, rather than looking at each review one at a time. Cons: It is not very intuitive how to use the software. The formatting has to be a very particular way in order for your records to upload properly. Overall: My overall experience with KeaText has been positive. Although there was trouble uploading the reviews initially, the customer service team helped us figure this out, and the analysis ended up proving to be helpful.